This is the book version. Of all the metals required for life, as we know it, there is one that stands out- silver. More uses for silver are discovered each year than for all other metals combined. Because new uses affect demand, and demand will affect price. in the world at the present time." Is silver one of the best opportunities for investment? 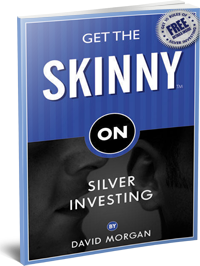 Certainly no one knows for certain but my book will open several possibilities to you that very few know about the silver market. Everyone that has ever thought of making money in the market should read this book and understand that opportunities like this are rare in the world of money. It takes courage to buy when very few are even aware of the potential, but the supply and demand fundamentals of silver are so overwhelming that anyone who understands basic economics will become excited about how significant this is for the silver market. The vast majority of investors know nothing about the precious metals markets and because these markets are so small any new investment demand will drive these markets significantly higher. There has not been a book written specifically about the silver market since the early 1990’s and most people familiar with precious metals are the baby boomers or older. There is a whole generation of people that need to be educated about this market. Electronic Version Only. Immediate Download!